Aside from all the symbolism that the umbrella has on Hong Kong recently, this is a paper cutout from the scene of the Opera Madam White Snake. 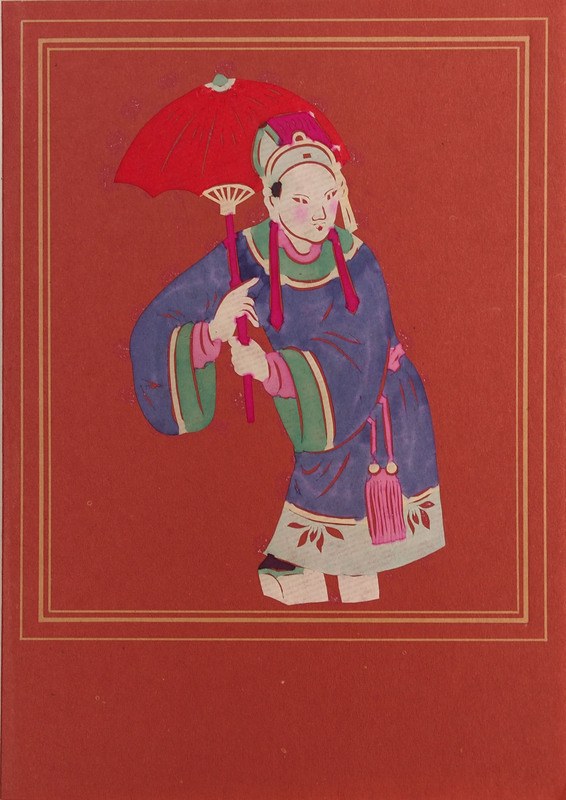 The story was set at the West Lake in Sung dynasty, one day in the rain the young gentleman Xu Xian (figure above) saw two pretty girl at the pier and offered the umbrella to them leading to the romance of the story. Earlier on, Xu Xian rescued a white snake, it was moved and fell in love with Xu. The white snake transformed herself into Bai (white) Su Zhen and together with her friend Qing Qing (green) appeared at the pier. Under her magical spell, Xu fell in love with Bai. Click to see an embroidery of the the same scene. 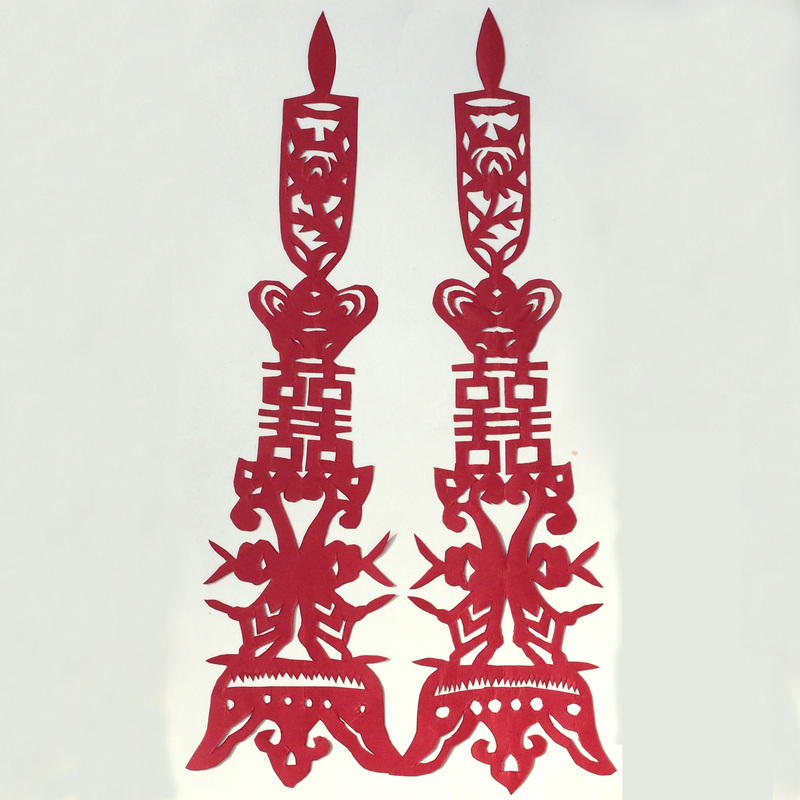 This paper cutout is a pair of candles on the wedding candle stand. On the candle stand is the word double happiness “喜喜”, the two of them giving the joy of quadruple happiness! Candles are a symbol of marriage, the word 花燭 Hua Zhu (flower candle) is synonymous with marriage. These red wedding candles will be placed in the living room as well as the bedroom of the couple. It is however interesting to know that the use of flower candles were initially for the bride’s family, to console the departure of their beloved daughter. 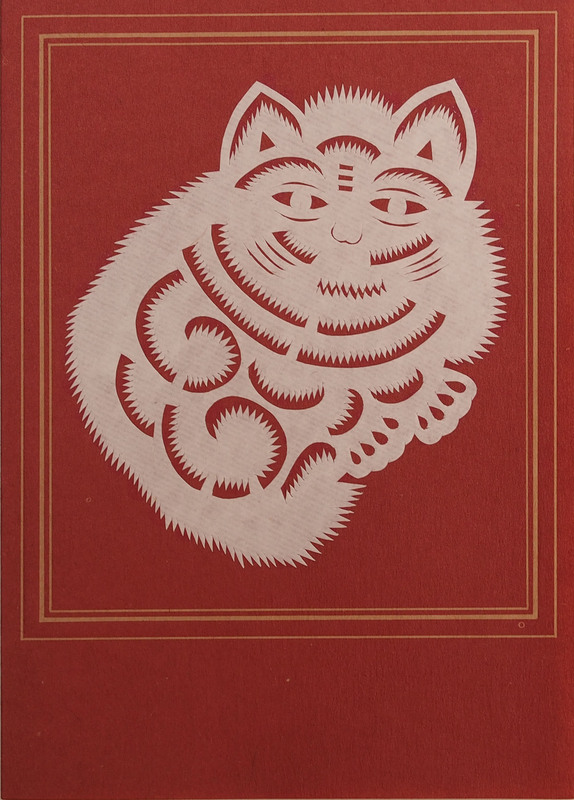 A paper cutout white cat on a greeting card. 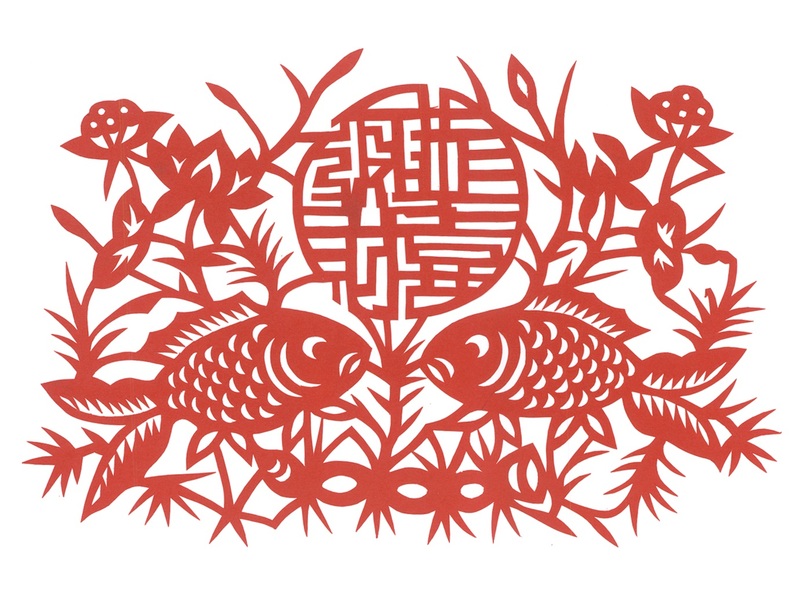 Paper cutout is a traditional Chinese craft, a simple way of decoration which was displayed on windows, lamp shade, anywhere with translucency of light . … and here is a talented white cat. 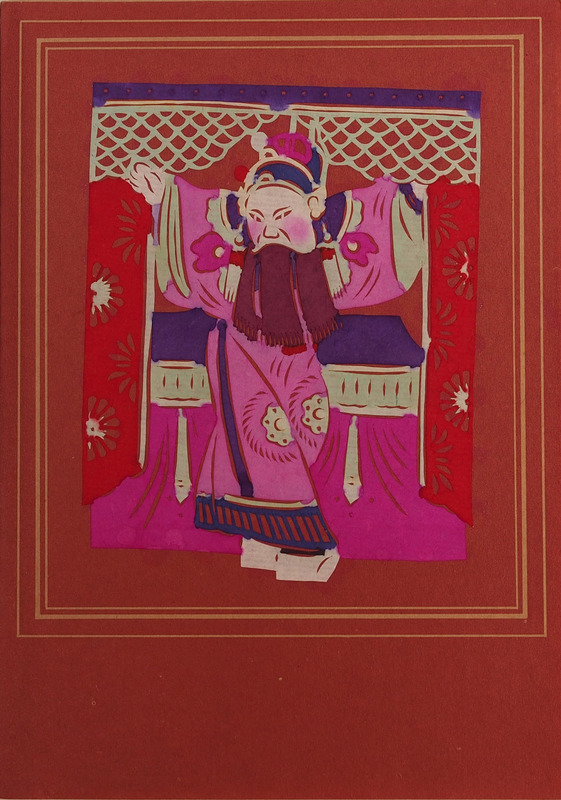 The scene of the paper cutout card is taken from Beijing Opera – Wen Zhao Guan. The story is set in the end of the Spring and Autumn Period (485BC), due to political slander Chu State offical Wu was under warrant while his father and brother was being executed. Wu was hoping to escape to the neighbour Wu State but at the check point (Zhao Guan) he saw his arrest warrant on the wall. Hermit Dong met him in the mountain and recognize that he was the wanted man but felt the unjust upon Wu and hid him in his home. For 7 days, Dong entertainment him talking about all sorts but not a word about the escape, Wu lost patient as he had planned to rebuild his power and revenge for his family and hanging around is like torture. Dong calm him down and said it was all planned out and that they were just waiting for a person. That night Wu was restless, he had the urge to leave and to move on but he was worry for his arrest at the gate. After a night of anxious tournament all his hair has turned grey, his was even more trouble but Dong was happy that his planned has worked out. Dong has a royalty friend Huang, who looked very much like Wu, Huang would pretend to be Wu and when the 3 of them cross the gate, the guard will only concentrate on Huang, now that Wu has a whole head of grey hair he was disregarded. 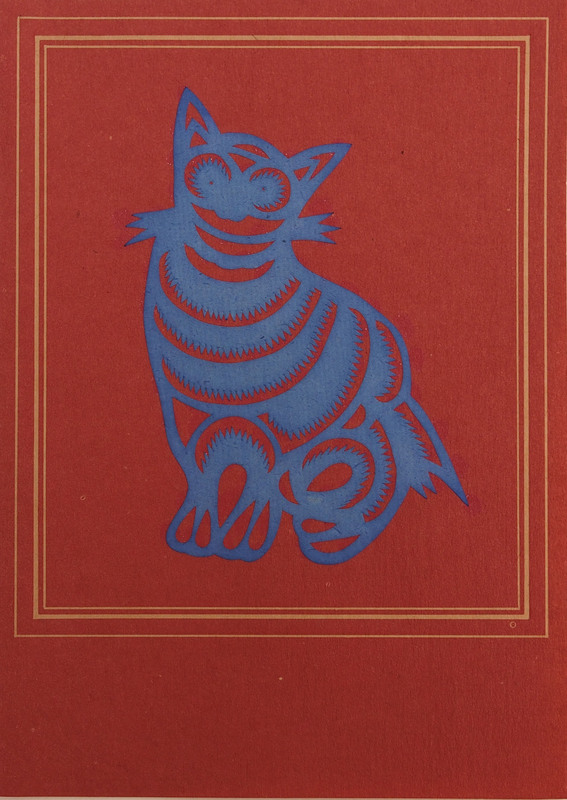 A series of paper cutout greeting cards of cats by Mountain Folkcraft. Here a blue cat in a sitting pose, ever wonder how many ways they can sit? Have a good weekend and spend some time with the cat! Reminded me of my childhood outfit for Chinese New Year. Covered in head to in red traditional costume. 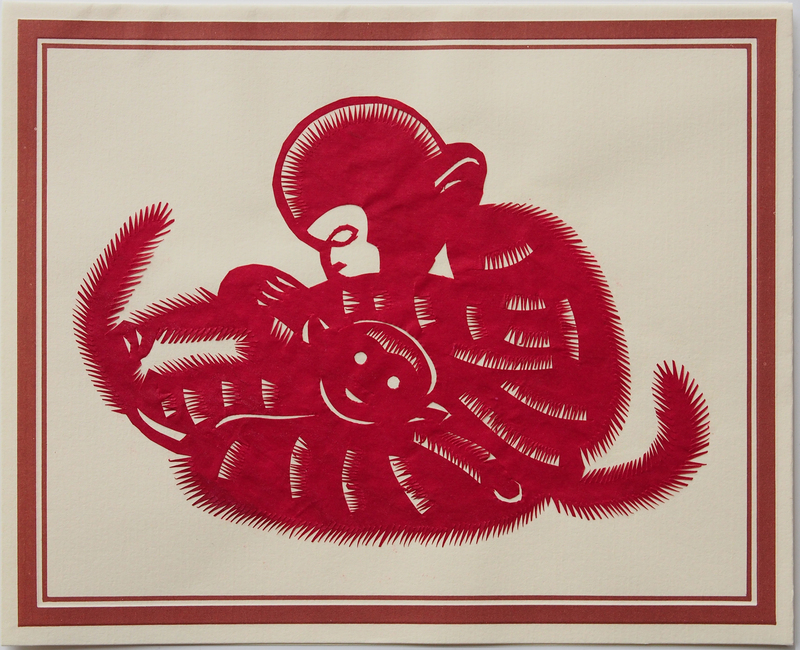 A paper cutout card of a mother monkey grooming her baby. 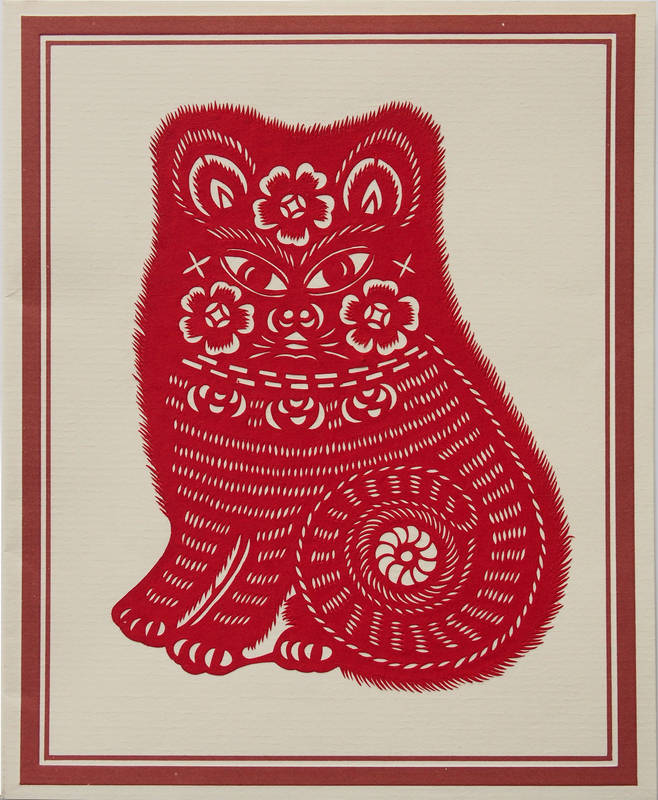 For the cat lovers, a paper cutout of a cat. 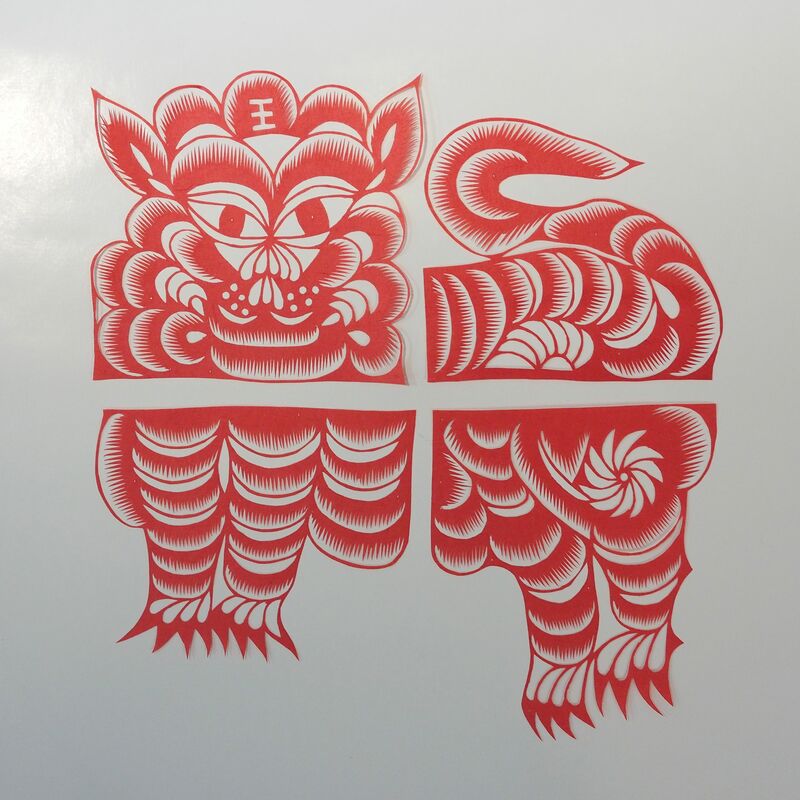 Wishing you a happy Chinese New Year this coming Sunday with this paper cutout. Lotus Plant; 蓮 (Lian) is has a similar pronunciation as 年(Nian) which means yearly and as its fruit has many seeds it is a symbol of frequent fertility. The Fish, 魚 (Yu), has the same pronunciation as the word “surplus” 餘. The pattern is symmetrical, portraying 2 of each item, the Chinese believes the bad luck comes in singularity (odd) and good in double (even). Lastly, the words in the middle is of course the famous Kung Kee Fat Choy! The paper cutout are normally displayed on the windows of every household with different idea of blessing. So here wishing you a year of surplus, fertility and many Fat Choy!